I've been wanting to try the subject of a raw egg for sometime. Here's my attempt. 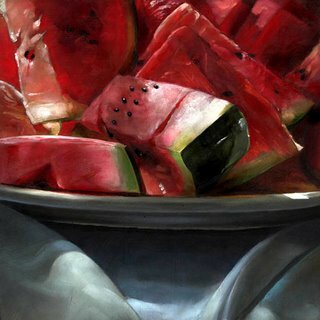 Like the watermelon, it was a challenge, but a blast to paint. I will definitely be returning to this theme in the future. My friend Robert Deyber has hit his stride. He has been working tirelessly these last couple of years to produce an extensive body of work that is proving to be very popular, and highly sought after. Presently, and most notably, his work was used for the cover design of Tom Petty's new CD Highway Companion. 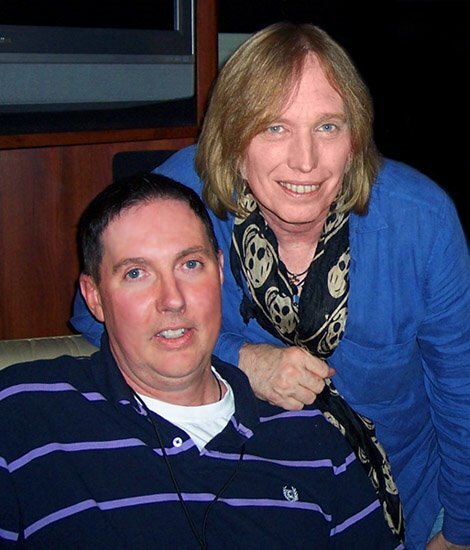 Tom Petty's wife found Bob's work, and quickly became a fan. 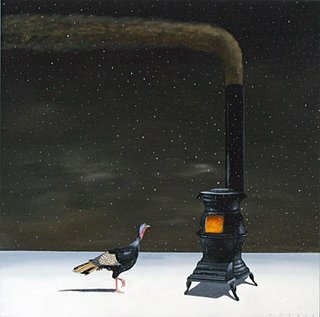 It wasn't long after that that they contacted Bob to commission him to do a painting for the cover of his upcoming CD. The final creation was a collaborative effort between Bob and Petty, and to quote mr. 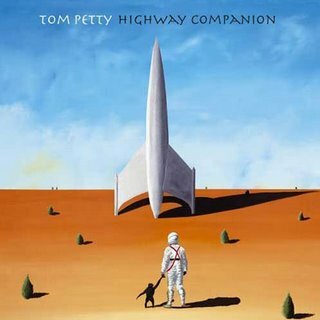 Petty, "It's the best cover I've ever had". Tom Petty and the Heartbreakers performed here in Atlanta last week, and Bob was kind enough to invite Karen and I to come along. We were allowed back stage, but sadly were not granted an audience with Petty. If you move to Bob's left, and go through a wall, that's where we were. The concert was great. The band was celebrating it's 30th year together, and their performance reflected that unity. It was great! Bob has also been added to the roster of artists at the Martin Lawrence Gallery. 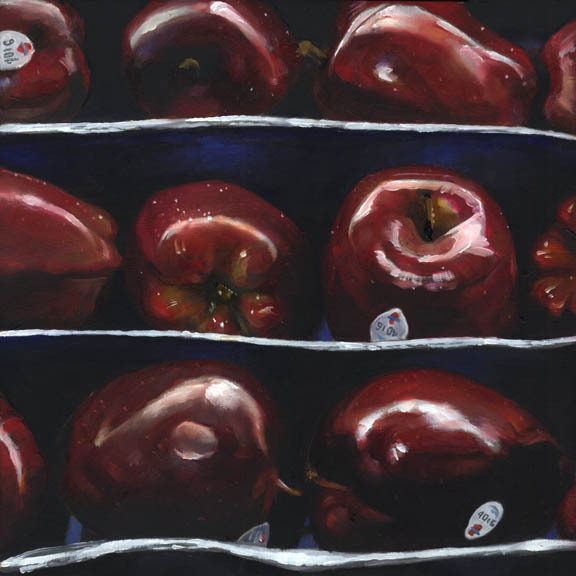 Representatives of Martin Lawrence discovered his work at the Art Expo in New York earlier this year. They were extremely enthusiastic about his paintings, and have spent the last few months preparing his debut. Although his representation with Martin Lawrence has not been publicly announced, Bob's work has been selling at a feverish pace. His official debut will be held at the Dallas, Texas gallery on October 28th. Congratulations Bob on your success. It's well deserved. 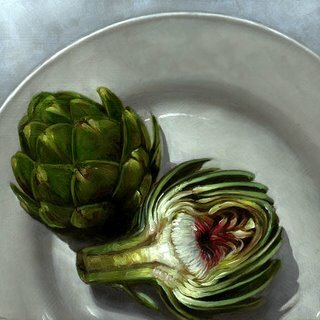 Tonight it's the artichoke. I don't consume them with any regularity. They're a bit too labor intensive for the return, but they do look cool. This delicate flower encased in armor. It's been a few years since my last artichoke painting, and it was nice to revisit them. I've wanted to paint watermelon for quite a while now, but never got around to actually doing it. 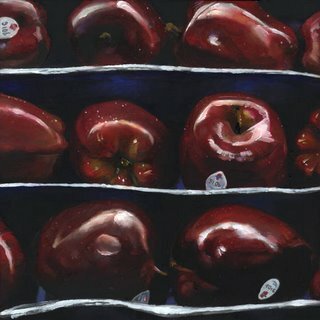 Karen is an old hand at it, having painted the fruit a dozen times. So, here is my first attempt. I have to say it was really fun to paint. I foresee my returning to this subject again in the future. 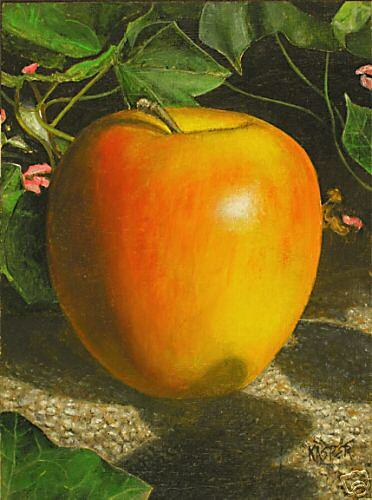 When I first began to paint my small six by six inch paintings, the size proved to be a problem. Fitting them on my easel, and having the ability to adjust their position to match my position, i.e. sitting or standing, was impossible. I knew Jeff Cohen had created a device to support the small plywood panels he painted on for his Fragments paintings, so I constructed a, rather crude, version of his device. It worked reasonably well, but it was kind of clunky. Then one day I was talking with my friend Mike Kasper over the phone, and I happened to mention the panel holder I'd built. I have to stop here to say that Mike is a kind of renaissance man. He can basically do anything with his hands. Painting, sculpture, photography, graphic design, carpentry, entire home renovation, I could go on and on. So, I describe this thing I'm using on my easel. The converstation ends, then a couple of days later, he shows up at my house with this elegant piece of equipment made of steel. From my description he had re-created my humble attempt, and produced something that worked like a dream. It will adapt to hold either my hardboard panels or small canvases. Plus, the whole thing moves on ballbearings so, it slides, "like it's on ball bearings". Anyway, I just wanted to show off this wonderful piece of equipment, that has made working my small paintings so much easier. I also wanted to draw attention to the fact that Mike has now joined the ranks of the ebay artists by placing a link to his listings. 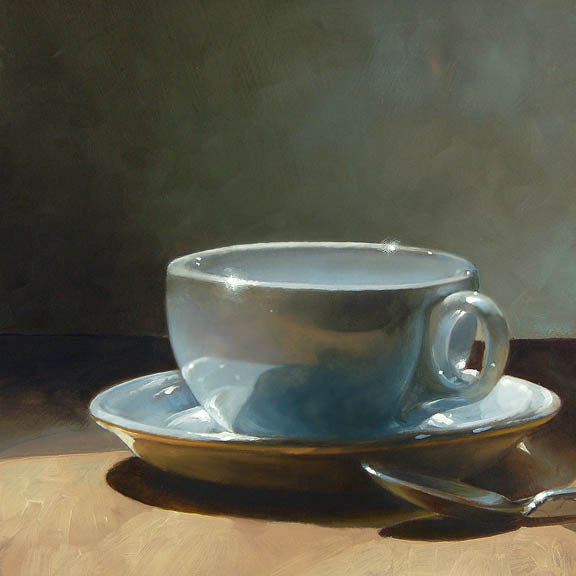 When I finished the pool balls I was still in the mood to paint something reflective but not metallic, so it seemed a good time to bring out the cups and saucers. I bought these pool balls a while back, but couldn't find a good way to present them. I photographed them six ways to sunday, but wasn't impressed with what I'd come up with. So I dumped them into this old glass bowl. Voila! I loved the distortion imparted by the varying thickness of the glass. Especially around the rim. 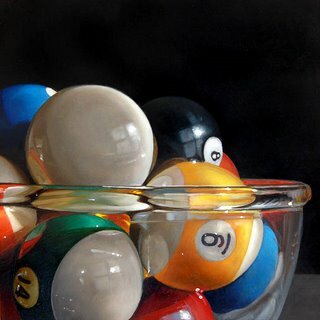 I spent a lot of time on this painting trying to portray the subtle variations of shadow, and reflection on the polished surface of the balls. 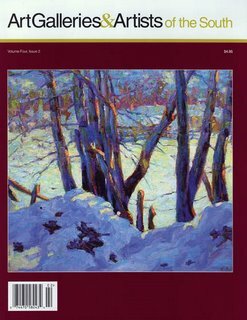 My wife Karen is one of the featured artists in the current issue of Art Galleries & Artists of the South magazine. 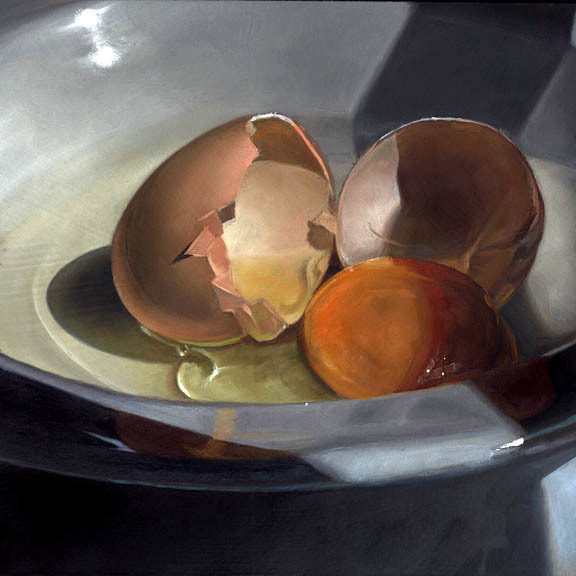 Her work was discovered at the John Collette gallery in Highlands, North Carolina. Paintings presented in the article are currently available at the previously mentioned John Collette space, and also in Atlanta at Twinhouse Gallery on Peachtree Road. I know that I'm biased, but I have to say that Karen is an amazing artist. And it's not only because her finished paintings are beautiful. But, because she lives for art. She is always (well most of the time anyway) either painting, talking to someone about painting, setting up her interior shots, cropping photos, writing down ideas for future paintings in her notebook, reading about art, on her way to the art supply store, or visiting a new gallery either on foot, or online. Her enthusiasm is almost overwhelming. I'm inspired by it. 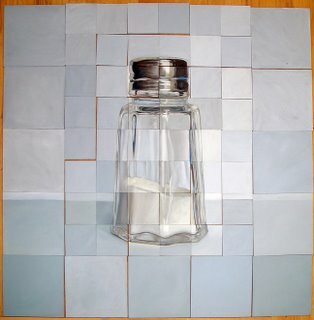 If you're not already aware of her work you can see for yourself at karenhollingsworth.com. I've really been in the mood lately to do something larger, with a lot of detail and subtle variations of color. So, I visited my stockpile of vintage auto photos. I try to keep up to date on current classic car shows in my area to increase that stock. These cars are restored with great care, and attention to detail. They are elegant creations from a era when design was about design, and not aerodynamics. This 16'' x 20'' painting will be going to Twinhouse Gallery next week, to selfishly take advantage of the fresh influx of patrons as a result of Jeff Cohens one-man show. 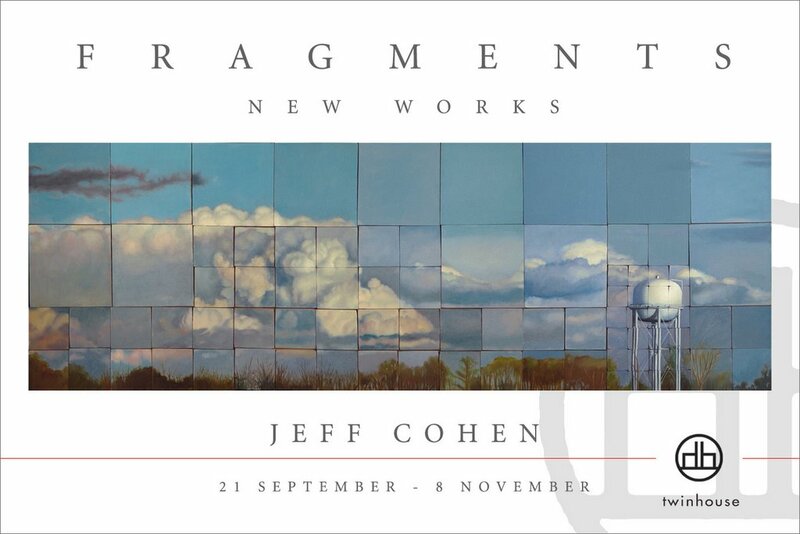 My long-time friend Jeff Cohen is having his first One-Man show at Twinhouse Gallery in Atlanta thursday August 21st. 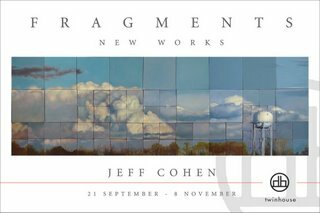 The show will include a number of his smaller still life paintings, but will concentrate primarily on his Fragments works. These paintings are created by dividing his subject matter into a grid of squares of varying sizes, and then painting every panel separately - each panel a painting unto itself. These panels are then assembled, and mounted onto a plywood frame. Since each panel is painted without reference to the final piece, the completed painting has a wonderful, and subtle, variety of color and tonal value. 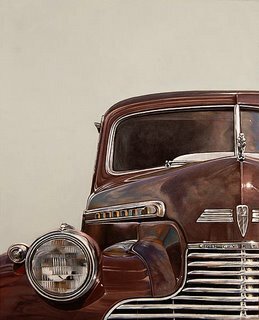 The sizes of the paintings range from a modest 12'' x 36'' to larger pieces reaching eight feet. You can view a short video of this process, entitled Painting A Bicycle, on his blog. I've known Jeff for more than twenty years, and I have to say he has one of the most fertile and creative minds I've ever seen. And it never sleeps. He's always got something new percolating. 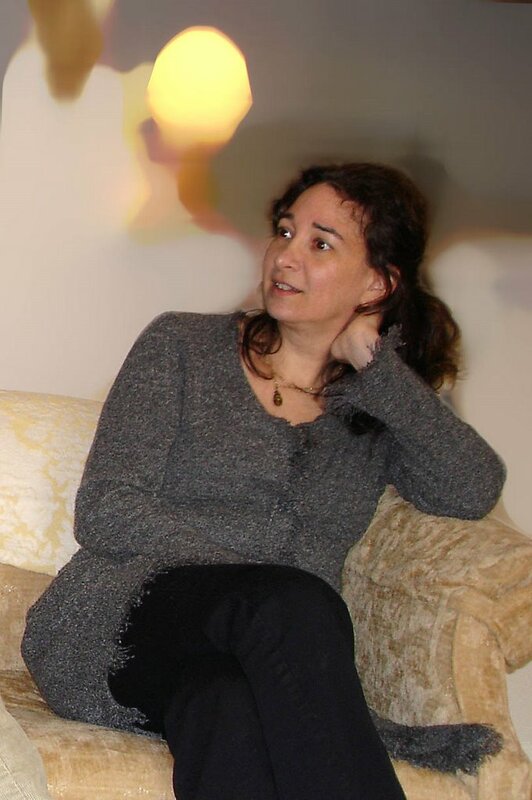 Whether it's music, art, home renovation (he and his wife Leslie Cohen, a graphic designer and fine artist, have transformed their home together), his garden, his kitchen (he's an awsome cook) - it goes on and on. What ever it is, it's always unconventional and always imaginative. Having said this, I believe that he has found his true calling in art. His boundless imagination and inate ability is a powerful combination that results in work that is sometimes unexpected, but always inspiring, stimulating and beautiful to see. I've been working on a larger painting lately, hence no sixbysixers. I thought instead I'd just post a photo of my working area. 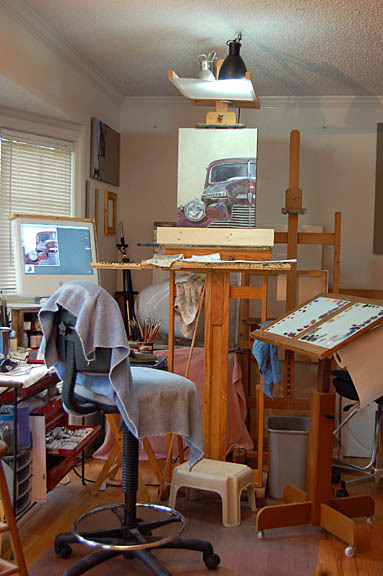 I'm always curious about the studio space of other artists, so, I thought I'd present mine. Karen and I have essentially split the living room of our house. It's the largest space with the best light. If you do a 180 from this position, you'll see her "studio". We get north light from the picture window (out of view to the left) but the trees tend to block most of that light during the summer months. Winter is more conducive to using natural light. I've constructed an adjustable lighting platform that combines a halogen bulb and a daylight fluorescent bulb. I built the palette table (to the right) which can be raised or lowered, and tilted or flattened depending upon my position. To the left is another table that holds brushes, an old tool chest that contains my paints, and my computer. 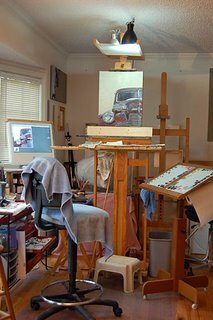 The monitor is a great way to view the images that I paint from. That's basically it. I should have some new pieces up in the next couple of days. 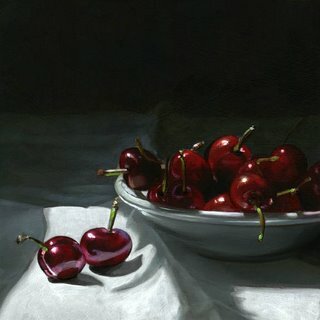 I think this may be my last cherry painting for a while. Take a break, then revisit them again in the future. 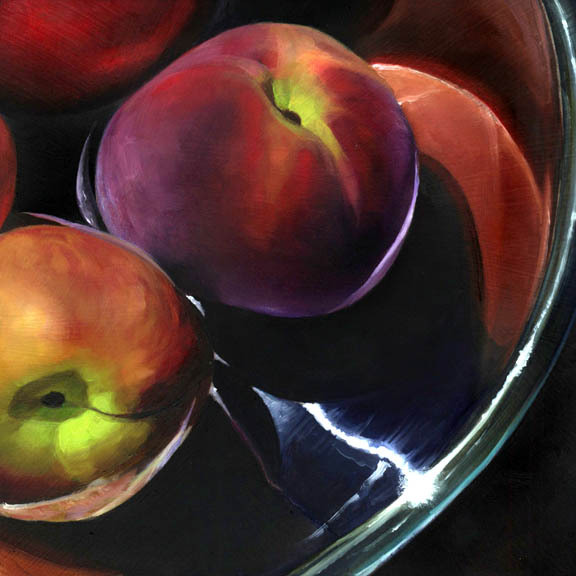 I haven't painted a peach in quite a while. We've had them on hand all summer, so I figured it was time. I love their colorful velvet-like skin. These are lying in a large stainless steel mixing bowl ready to wash.
Our local farmers market is a goldmine of beautiful fruit, vegetables, cheese, bread, etc., to paint then eat. But, they are a little shy about having their produce photographed. We had gotten off only a couple of shots before the management asked us to put away our cameras. Or leave. I may have to get a smaller camera, and be a little less obvious in the future.